If you’ve been caught speeding, fined or sent on a speed awareness course, the impact of speeding is probably fresh in your mind. How long, however, before the bad habits start creeping back in? Surely a few miles per hour over the statutory speed limit isn’t that big a deal? The truth about speed may surprise you. Even a slight increase over the speed limit can make a big difference to stopping distances and the impact speed in a collision. Research by AA Drivetech shows that if a pedestrian steps out in the road in front of you, at 30mph, you will come to a stop in 23m (in normal road conditions). As long as they are 23m ahead of you, you won’t cause them any damage at all. 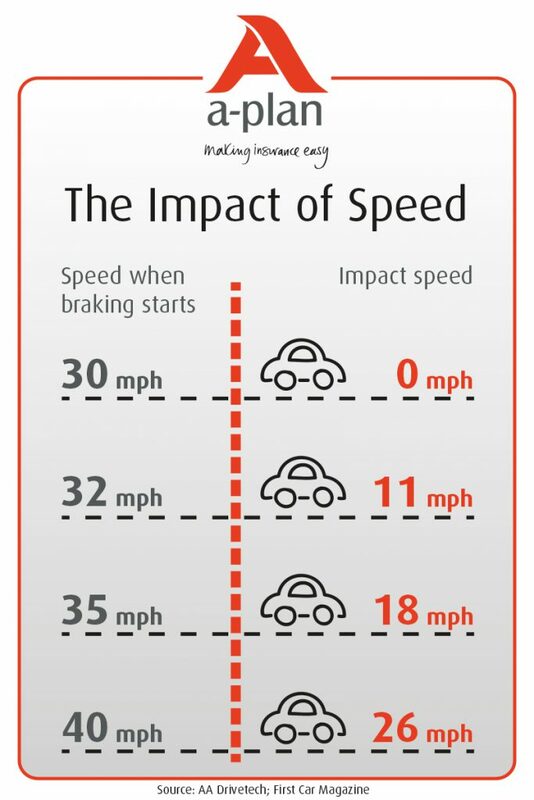 Travelling just 2mph faster means that you’ll still be moving at 11mph when you hit them, even if you start braking at the same point. That sort of impact could easily break a pedestrian’s legs. Hit the brakes from 35mph and you’ll still be doing 18mph at the point of impact. If you have allowed your speed to creep up to 40mph, when you collide with the pedestrian, your car will still be travelling at 26mph. At that speed, the consequences could be fatal.